Many women experience excess facial hair, especially as they age. The root of the problem: the overproduction of male hormones called androgens. All women’s bodies generate these hormones, and commonly do so without producing excess hair. So long, that is, that hormone production levels stay normal. But several factors can pull androgen production beyond the normal. Big factors here include heredity and obesity. Fat cells store androgens. 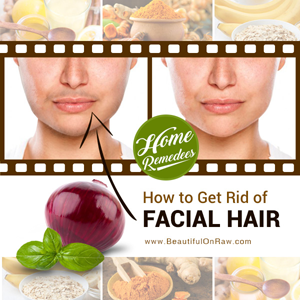 Some medical conditions can lead to unwanted facial hair. Corticosteroid medications—prednisone, birth control pills, and hormone replacement treatments among these—can all affect hormone levels, too. Menopause can bring a decrease in the production of estrogen, also leading to darker and more prominent facial hair. Lemon juice and honey. Apply a mixture of 1 tbsp. of juice and 4 tbsp. honey. Remove gently after 15 minutes. Raw papaya and turmeric powder. Create a paste combining 1 to 2 tbsp. raw papaya with ½ tsp. of turmeric powder. Massage onto face. Rinse away after 15 minutes. Oatmeal and banana. Create a paste with 1 ripe banana and 1 to 2 tsps. of oats and massage into area for 15 minutes. Rinse off with water. Water and turmeric powder. Create a paste by combining 1 to 2 tsps. of turmeric with water. Wash off after 15 minutes. Basil and onion. Remove the thin translucent film from between the layers of two onions. Crush 10 to 12 leaves of basil with the film to create a paste. Apply the mixture to affected area. After 15 minutes, rinse off. Organic gram flour and turmeric powder. Create a paste using 1-2 tsp. of turmeric with ¼ cup of flour and water. Apply to area and leave until dry. Wipe away gently with a warm cloth. These methods will require consistency and patience. A few applications won’t do it. Nor will spotty use. Consistency over many weeks is what you’ll need for success. It’s a cluster of natural processes working together that give these remedies their powerful practical value: exfoliating, cleansing, moisturizing, and anti-oxidant properties. The one ingredient that appears most often in good homeopathic recipes is turmeric. Turmeric has been used for many generations across many cultures, for radiant, healthy skin. In addition to having anti-bacterial and anti-inflammatory properties, it has also been shown to prevent excess hair growth. It’s nothing less than wonderful for the complexion. This is why I’ve selected turmeric as one of the ingredients in my new GlaciClear Facial Masque, and combined it with several other nourishing elements, including Canadian Marine Glacial Clay, aloe vera, green tea, and chamomile extracts, for undeniably fresh, clean results. Applying this masque daily will not only give you a glowing, blemish-free complexion, but it will keep the facial hairs at bay.